We've started to collect quite a lot of supplies for our fun sessions, I'm always on the lookout for bargains to enhance our sensory, motor skills or invitation to play time. I've found some goodies in the supermarkets recently such as hair gel in tesco for 15p, the pound shop is never going to beat that! I'd highly recommend going to the supermarket before anywhere else. I've also been buying quite a few bits that were intended as party bag contents such as mini dinosaurs, gold coins, mini footballs and mini lizards, these are quite small so no good for toddlers still popping everything in their mouths. I've found some great things in the card factory and on ebay. We got to the stage where I had 2 or 3 totes containing all the supplies, so I used an old crate to contain it all, the funny thing is, if I leave the box out T keeps asking for things out of it. There's loads in there that T hasn't even seen yet, I'm sure there's enough to keep us going for a year at least! My goodies started to get out of control and so along with the box I created a simple form to record everything on, this helps for a couple of reasons; 1. I'm soon going to double up on something because I've forgotten it's at the bottom of the box, 2. 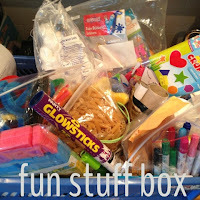 When the initial fun box becomes to small (this will be soon!) I will start to record where something is stored, I'm not yet sure how I will organise it but I'm sure that by christmas we'll have a few containers full and having a list will save searching through each box. I'm looking forward to perusing the shops for seasonal goodies soon for halloween and christmas, for some lovely themed play as the days start to draw in. If you would like to see our fun box & useful household objects list it's available here a blank copy for you to download and complete is available here. NOTE: for some strange reason the forms don't look correct in google.docs, however, when they are downloaded they are fine. Apologies, I didn't want to hold up this post, but I will work on a better method for my next downloads.